As the majority of horse lovers will already know, this week sees the open and close of the world-renowned London International Horse Show, better known as ‘Olympia.’ Hosted at the capital’s historic venue, Olympia International Horse Show is now in its 111th year and continues to deliver top-class equestrian sport and entertainment to an annual audience exceeding 85,000 people. The event is a legendary display of global horsemanship and popular disciplines ranging from dressage to show jumping, showing and driving, in a festive competition setting that the horse world embraces year on year. 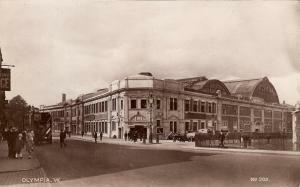 The venue Olympia first opened its doors on Boxing Day, 1886, unimaginatively titled the National Agricultural Hall. From here on, the venue consistently drew the masses, satisfying their appetite for occasion with new and exciting spectacles that were to become regular fixtures at Olympia. Only a year after its grand opening, the first London International Horse Show was held – an event that has remained popular there for over a century. In 1907, show jumping was added to the programme, with most early participants being of a military background. The popularity of this as a spectator discipline meant it later developed a division for civilian riders too, with lapse rules and ‘questionable decisions’ tightening up and prompting the formation of the British Show Jumping Association. Despite now accommodating audiences in their thousands – 2013 saw a record number of spectators attending Olympia, with 95,276 people passing through its doors – the original building only held seating for 9,000 show-goers in an illustrious Grand Hall that attracted architects from all over the world. The London International Horse Show was also the show of choice for many of Britain’s great monarchs, both past and present. Queen Victoria is believed to have attended Olympia for the show at some point during her reign, while Queen Elizabeth II paid visits both as a princess and then later, when she became Queen. It is also rumoured that King Edward VII maintained a private suite on the north side of the Grand Hall to entertain his numerous female acquaintances when they came to see a show. When the National Agricultural Hall was unveiled to an excited public in 1886, its breath-taking design and construction - with the sky-high roof of its Grand Hall scaling 100ft, and its generous marble columns and oak-panelled banqueting rooms - it quickly adopted the new name, 'Olympia,' in keeping with the sense of pleasure and promise it heralded. However, despite its illustrious start, Olympia was thrown into financial difficulty when the Royal Tournament, which was originally meant to re-locate there, failed to do so. It was purely thanks to the need of the Paris Hippodrome Circus for a new venue that Olympia narrowly avoided ruin. Annual events such as the London International Horse Show have ensured the continued success of the venue, consistently drawing the crowds with sport, suspense and shopping. In 2014, Olympia got off to a flying start, with world records being broken on the very first day. There was also the Metropolitan Police activity ride on the Tuesday evening, and an earlier showing of the spectacular Ukrainian Cossack stunt riders. Wednesday saw the world cup dressage freestyle to music and the Shetland pony Grand National. Thursday was the turn of the driving specialists, the Kennel Club agility grand prix and stakes, and the much anticipated puissance. The packed programme continued through Friday - when international show jumping takes centre stage - to Monday evening when the spectacle ended with the Olympia grand prix and Christmas finale. The show, which over the course of 7 days involves some 400 horses and ponies, comes to a close just in time for the most festive week of the year, making it your last opportunity to catch a glimpse of top-class equestrian sport in action. - 1,878 bottles of champagne will be drunk at this year's Olympia - it is Christmas after all! - 220 shops will be open for business during the event, offering just about anything from horse rugs to coloured silks, grooming products and unique gifts. - 276 stables will be assembled for the 400 horses and ponies that attend the show. Add to that the 32 tonnes of stable bedding that's needed to keep the horse competitors warm and dry during their stay. - 50 bales of hay and 82 bales of haylage will ensure the horses are well nourished over the course of the event, giving them the vital energy they need to perform at their best! - 12,000 hot drinks will be served to Olympia's visitors to help them through the morning, afternoon and evening's nail-biting entertainment!